The MaterMacc Precision Vacuum Seeder is the newest most versatile seed planter available, offering the latest in patented vacuum seeding technology. The planter can singulate all sizes of vegetable seed from the smallest raw carrot and lettuce seed to large lima bean size seed. 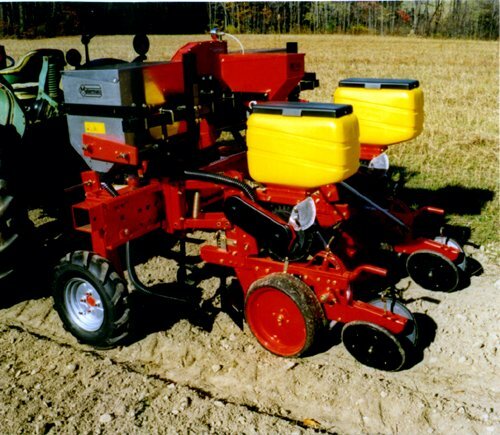 It can be fitted with the optional Easy Set Toolbar System that allows you to quickly change the row spacing from 15" rows and up. (10" rows and up with optional equipment. You can also quickly add or remove planters to change the number of rows being planted. It has optional stainless steel fertilizer and insecticide hoppers with an easy set application rate adjuster. The MaterMacc is the next generation of precision vacuum seeders and is the most versatile vacuum seeder available today. This may be the only planter you need! It is our best planter! Finally, one planter for all size seed, quickly adjustable for most row spacings.